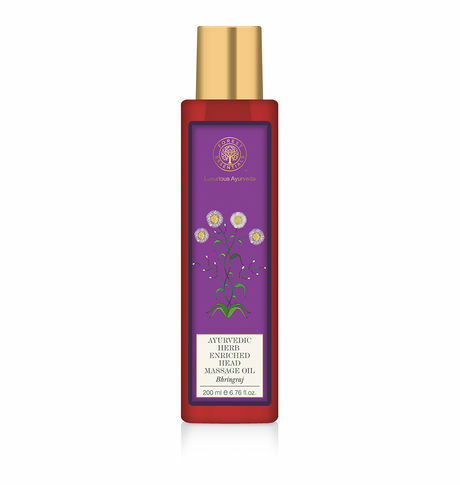 This nourishing hair oil is made from an ancient recipe, documented in the Vedas, which includes Black Sesame and virgin Coconut Oil along with Goat's Milk and Herbal Extracts. This hot oil treatment is very effective for hair loss and scalp problems as it aids the growth of healthy hair. This Bhringraj Head Massage Oil contains Organic Black Sesame & Virgin Coconut oils which have been used since ancient times documented in the Vedas or ancient Indian text. Nourishing properties of these oils with essential vitamins and fatty acids are easily absorbed into the skin and make the head deeply relaxed and also help balance the body's energy flow. Herbs including Bhringaraj, Mulethi, Brahmi, Henna, Anantmool, Lodhra help to improve hair growth, quality and colour.